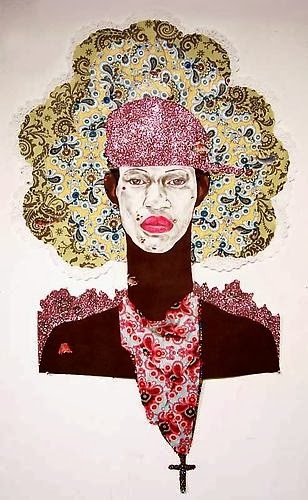 Recently, I had a discussion with my teen about the Dominican, Haitian connection in my family, and it inspired me to look for a gallery that featured Haitian artists. I found a listing for a gallery called BrutEdge in Jersey City, New Jersey. Having just opened this September, I wondered how I could have missed the opening reviews. I think this gallery is off the radar, but it won't be for long if their exhibits continue to be as satisfying as the inaugural show, "Caribbean Cream: What you see is What you do." This collective exhibition features artists from the Caribbean and the Americas. The co-founders Gail Granowitz and Reynald Lally promise to focus on artists primarily from these under-represented groups. The ground work for their mission has been solidly set with an impressive showcase of contemporary artists. 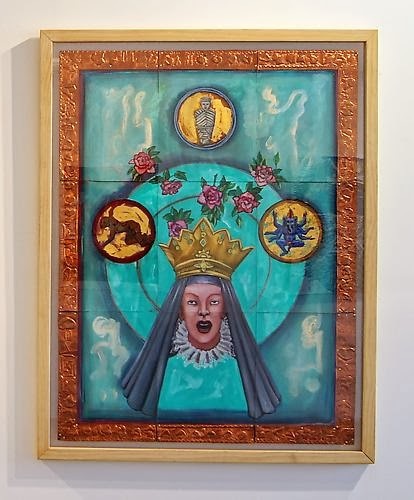 You'll find the work of artists Olivia McGilchrist, Marvin Bartley, Dionne Simpson, Edouard Duval-Carrie, Carlos Estevez, Florine Demosthene, Ebony G. Patterson (to name just a few). The exhibition feels like a convergence of catabolic pathways as the images generate and release their intense energy and messages. I am planning to take my teen surely before the show closes on November 23rd. This is exhibit is perfect for most.